When someone asks me how to harvest herbs, I usually say: "Just snip!" Sure, there's more to it than that. But it's not rocket science, by any means! With a few simple tools and these basic harvesting techniques, your teapot will be filled with deliciousness - and your herbs will continue to thrive! Sharper is better. You want to cut the stems of your herbs, not tear and squish them! For my morning tea, I often take my cup or a small tea pot out to the garden, fill it with fresh herbs, and bring it inside to brew it up. Gardening gloves - You'll be happy to have them, especially when you're gathering hips from thorny rose bushes! If you're anything like me, you'll have the urge to start snipping and sipping as soon as your herbs start growing. The minute the first mint shoots poke up through the ground in springtime, my taste buds say: "Yeah, baby - game on! Time for some fresh mint tea." The urge is even stronger when my stevia plants start sprouting new growth. Sweet mother of everything yummy, I'm ready to whip up a fresh batch of stevia syrup! Grow, little Stevia plant. Grow! But ... early in the season it's super-important to remember that delayed gratification is actually a good thing. Give your herbs a few more weeks to get a healthy growth spurt going, and you'll reap the rewards later with a much more bountiful harvest. Helpful Hint: A tiny snip here, a little taste there. That's okay when your plants are young-ish. Leaving your herb babies half nekkid in their infancy? Nope, don't do it. So ... when can you begin harvesting your tea herbs? When they're ready. Conventional wisdom says that wind and sun sap the essential oils (the good stuff!) from the leaves of herb plants. For the most intense flavor, they say, it's best to harvest on a wind-free day, in the early morning, shortly after the dew has evaporated from the plant. Well, that's an excellent plan -- if that perfect timing fits into your busy schedule. For me, it usually doesn't. So I harvest when I have time to harvest. 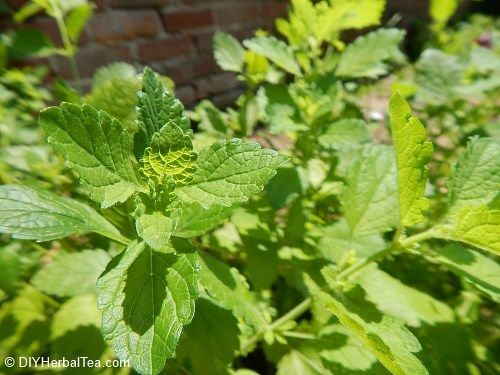 Interestingly, I've noticed that some of my herbs (my lemon balm and stevia, especially) are more flavorful in the early afternoon, after the sun has had a chance to warm their leaves. Lemon Balm in the Afternoon Sun. Mmmmm ... Such a Sweet, Refreshing Scent! Of course, who am I to quibble with the experts?! Taste test in your own garden. Snip your herbs at different times of day and see what you think. Okay, let's "fast forward" to summer. Your herbs are well established in your garden or in their containers on your deck, patio or window ledge. There are a few ways to go at it, depending on which parts of the herb you'll use to make your tea. Harvesting leaves from your herb plants is simple. 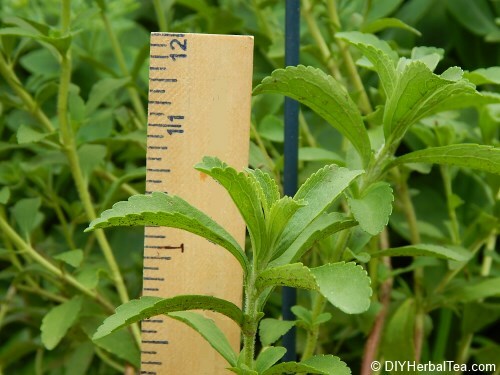 Cut a healthy-looking stem, then strip off the leaves. 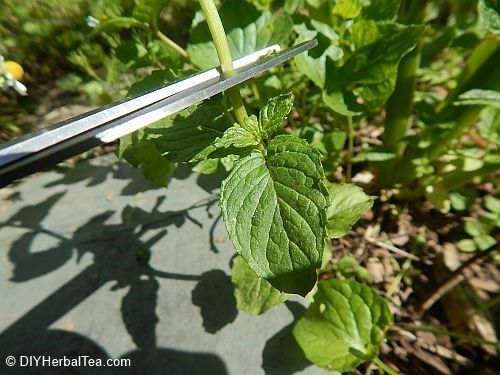 I usually cut just above a leaf junction (the place where a set of leaves grows out of the stem). That encourages the plant to generate new growth. 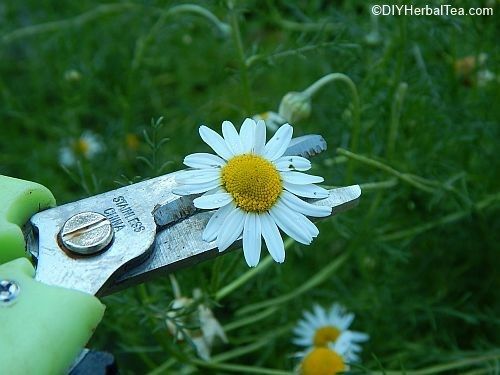 For "once and done" flowers (like chamomile), cut at the base of the blossom where the flower head meets the stem. 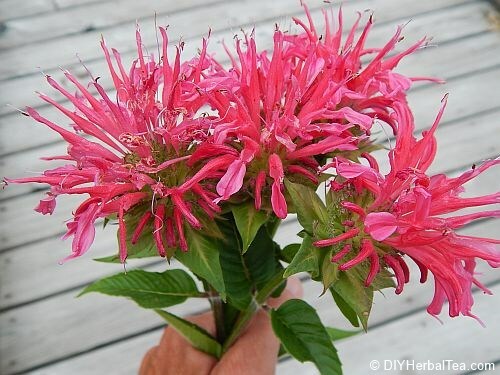 For "cut and come again" flowers (like bee balm and anise hyssop), cut entire stems, leaves and all, just as you'd cut a bouquet of daisies, roses or any other garden flowers. Ready to Become "Oswego Tea"
Try not to cut more than 1/3 of a plant's growth at any one time. If you take away too much, the plant might have a hard time recovering from such a severe "haircut". Perennial herbs: Stop harvesting about a month before the first hard frost is likely to hit your area. 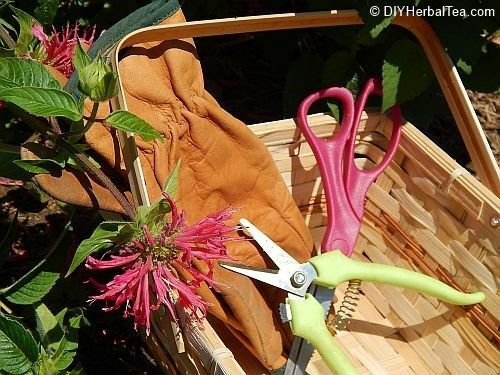 Your perennials need a little time to wind down before their long winter nap. Annual herbs: As fall approaches, go ahead and cut, cut, cut to your heart's content. Annuals are "once-and-done plants", so pick and preserve as much as you can before the plant gives up the ghost.